14th century house completely renovated in 2013 - very bright and comfortable. Classified 3 stars cottage Côte d'Or. Discover Flavigny-sur-Ozerain in Burgundy, a medieval village classified as one of the "Most Beautiful Villages of France", this Burgundy town tells its medieval history through its ramparts, its fortified gates, its cobbled streets, its houses ... and who dominates a beautiful hilly countryside. We cracked for this 14th century house, its old stones, its typical "cheese", its well included in the wall of the facade. We have preserved its charm and history by renovating it with high standards and comfort. She is warm, in a calm environment. She furnished with beautiful family furniture. The kitchen is equipped with modern appliances with lots of cookware and pretty crockery. On the ground floor: Large room 35 m2 with kitchen, living room, dining room, wood stove - large sliding patio overlooking terrace with garden furniture, parasol and sun loungers. A scullery with washing machine, wardrobe. Toilet with washbasin. Upstairs: 2 bedrooms - 1 bedroom with double bed 160 - 1 bedroom with 2 single beds 90 and a folding baby bed. Shower room with shower, WC. Vaulted cellar and local bike. Heating: Electric and wood. High-performance Wifi - TV with VCR and DVD - Bluetooth stereo, MP3, USB key. A Yamaha digital piano. You will find in the cupboards of the house: oil, vinegar, basic spices, tea, coffee, sugar, rice, dough ... cleaning products, like at home! The house is equipped to accommodate young children: folding bed, high chair, baby bath, changing mat, safety gate at the top of the stairs, games, books and videos for young and old. OPTION according to your request: the linen (sheets, towels, tea towels) and the cleaning after your departure - to reserve on the web or to ask us on your arrival. You will find in the village: L'Echoppe - grocery store, bread store, tearoom and snacks, regional specialties - in the old school of the village with its terrace in the small playground - La Grange, peasant inn, products from the farm, open all summer and Sundays out of season - the restaurant of the Abbey - The shop of Anis de Flavigny, regional specialties, bar, ice cream. 7 km: Venarey the Laumes all shops including 2 supermarkets. To visit more than 30 km: The sources of the seine, Forges de Buffon, the castle of Epoisses. The town of Vézelay at 70km, Dijon 80km, Beaune 60km, and the Morvan Nature Park. We offer the rental of linen (sheets, towels and tea towels) and the cleaning fee to finish your holiday quiet! Without forgetting the Bourguignonne Gastronomy, its wine, the cheese of Epoisses, the ham parsley ...! Water comes to your mouth? Be welcome to discover this region rich in heritage and beautiful nature! You have at your disposal: Kitchen background very provided, tea, coffee, oil, vinegar, pasta, cleaning products ... at home! The beautiful stone house in the village of Flavigny was perfectly located. It was refurbished in a caring way. All amenities were as the owners listed however, there were some exceptions. The charge for linens came as a surprise but I figured it was a local thing. The linens that we received were very old and the sheet would not stay on the bed. Certainly not worth the 40€. The suggestion by the owners to pay cash 40€ on checkout seemed odd. When checking on the VRBO website, it made clear that all charges are to go through VRBO. I'm happy that you enjoyed our house and its layout. I'm sorry about your comment regarding the laundry; all duvets, sheets and towels have been bought 2 years ago with a low number of use. A really comfortable gite with everything you could possibly need in the house. Wonderful town. Mark R.Noosa Heads Queensland, Australia. Very comfortable, clean, great position in the village. Everything in good working order. Really nice to have some basic supplies on arrival such as tea, coffee, water, cleaning products etc. The village is beautiful and is well situated to explore towns such as Semur en Auxois, Dijon, Beaune, Avalon and les Laumes. Dear Michaela and Mark, Many thanks for your fine comment. You stay one month and you visited many beautiful place, I'm very happy that you spend the nice stay ! I wish you pleasent holidays in France ! See you soon ! Corinne was wonderful in responding to questions and helping us arrange everything including horse riding lessons for my 3 girls, which they loved. Cottage was a good size for our family. Village is beautiful with lots to do in the local region. Lunch on the balcony was very pleasant. Would definitely stay again. I am very happy that you and your family liked your holidays in Flavigny ! With pleasure to welcome you again, there is some more of things to be discovered with your young people, the Park of Auxois, Alésia's muséoparc, castle of Bussy Rabutin ... unless 10 km of Flavigny ! Flavigny is a picturesque and peaceful town in a beautiful setting, and the house fits in perfectly. Over the course of 2 weeks, we found many diverse ways to entertain ourselves and our 2 kids (boys, aged 10 and 7). Walking, cycling and a sweet factory in the immediate vicinity, the Museopark Alesia just down the road and the reservoir de grosbois to cool down on a hot day. Further afield, Dijon and Dole both make for great days out - the 'Canal des Tanneurs' in Dole is particularly worth a visit. Best visit was probably Guedelon castle - started in 1996 but constructed entirely using 13th century methods. Fantastic holiday! We had a fantastic week here in July. This small village is full of character and the house oozed charm. As well as being visually pleasing, the layout of the property and its fixtures and fittings is also highly practical. It is also extremely well provided for in terms of the equipment - plenty of pots and pans, crockery, a vacuum cleaner, even a dishwasher and washing machine, and much more (we have never had such a good property!). A lot of thought obviously went into the renovation; a particular feature is the 3-part patio door which pushes back into just 1 segment, opening up the main room onto the spacious terrace, which comes with a table, bench, chairs and a parasol. In addition there is bicycle store beneath the house which also housed our car's bicycle carrier. There is plenty to do within up to an hour's drive: villages to visit e.g. Vezelay, Semur; walking or cycling along the very well-maintained Burgundy Canal which passes just beyond nearby Pouillenay; take a tasting at one of the many local wine caves or cheese producers; visit the Roman remains at Alise/Alesia with its new visitor centre (then follow up by reading 'Asterix and the Chieftain's Shield' (Fr. 'Le Bouclier Arverne') which is based on the story of this site!). Also don't forget the restored Abbey de Fontenay with its chequered history. For supplies, Venarey Les Laumes is just a 10-minute drive away and has petrol stations, supermarkets, and the railway station Les Laumes-Alesia which has trains to Dijon once per hour, returning from Dijon up to 9pm (journey time half an hour, half what it takes in the car, and parking in the station car park is free all day!). Then when you have done all that, find a buddleia or lavender bush in full sunshine and site and identify the exotic butterfly visitors! By chance we found ourselves there on Bastille Day and so went to see a [free] local firework display. Benedicte, one of the owners, lives next door and although my French is not very extensive, I had no trouble understanding her as she takes care to speak clearly and without too much complex vocabulary for those of us hopeless Brits who don't speak much of anything else! She also speaks German. 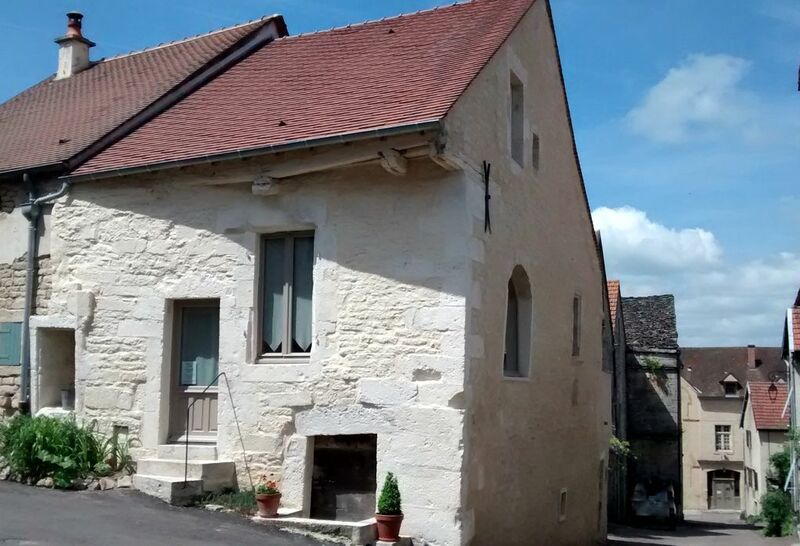 We would thoroughly recommend this property for a visit to Burgundy. Great ! You had a fantastic week and you have never had such a good property ! And we have never had a testimony so laudatory and so detailed about our house ! We had a lovely time. Evidently It was a very quiet time of the year which was great for us. The flat was complete for a family with little ones as well as a mature couple. The landlords, who are neighbors, were warm and welcoming when we arrived without our phone working out of our own country. They walked up to the Grange to meet us. A gorgeous town. We enjoyed walking around town each day to experience it's beauty. A larger and more comfortable couch to sit on would have been appreciated in the evenings. We would spend time sitting on the couch in the evening to relax. We would return if we get the chance. You can't find more beautiful countryside! Thank you very much for your nice comment ! Yes Flavigny is a very beautiful village and our house in the heart of the village it's great to visit it ! About your remark about our sofa : we preferred to buy this size of sofa, comfortable for 2 or 3 people and with 2 armchairs for a cottage for 4/5 people. We wish you a beautiful summer and see you soon I hope. Flavigny-sur-Ozerain, medieval city 'One of the Most Beautiful Villages of France'. Nearby: Alesia Muséoparc - Fontenay Abbey (world heritage by UNESCO) - Castle of Bussy Rabutin - the animal park and recreation Auxois - Burgundy Canal - The medieval town of Semur-en-Auxois - 30 km: The sources of the Seine, Les Forges de Buffon, Epoisses, Montbard aquatic center. Nearby sights of interest. Alesia MuséoParc, the Abby of Fontenay (UNESCO World heritage site), Chateau de Bussy Rabutin, Medieval city of Semur-en-Auxois. Flavingy is withing 70 km of --other Such large websites have Vezelay, Dijon, Beaune and the Morvan Natural Park. Option : Location linge - draps - serviettes de toilette - torchons (linen in option) : 50 € Option : Ménage après votre départ (homecleaning in option) : 50€ Information chauffage : consommation 300kwH inclus dans le prix de la semaine (consommation normale) si vous dépassez cette consommation le supplément sera de 0.15€/kWh - poêle à bois avec le bois en quantité dans la cave.